We can all agree that Data Age was not a very good game publisher, or were at best average. 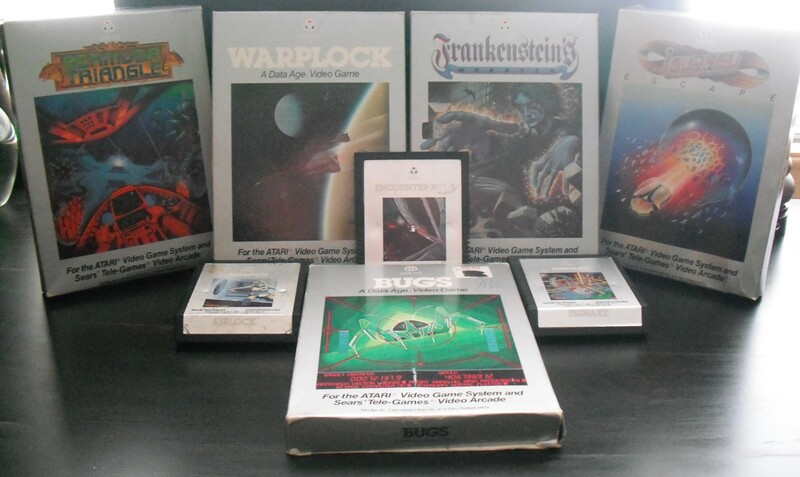 Out of their eight released games I would classify only one of them as great (Frankenstein’s Monster), four of them as good to average (Journey: Escape, Bermuda Triangle, Warplock, and Encounter at L-5), with their three stinkers being Airlock, Bugs, and Sssnake. Despite the bad rep that Data Age had they really tried their best with the packaging, even if the game inside wasn’t worth the circuitry it was printed on Data Age gave all of their love and care to making these some of the most eye catching boxes out there. It is even said that some of the box art was done by Marc Ericksen who also drew the box arts of Megaman 2 and Strider on NES and he even did the Tengen Tetris box art on NES as well. Like with most game companies the box designs are not uniform across the entire run, there were several small changes made to the design while still maintaining the overall look. Data Age had to generations in their box designs, there are three that I know of. Early box designs are fairly standard, the standard Data Age Silver Box with large white bold font stating the title. The back is just a small blurb with no pictures apart from a line illustration of the controller, it’s all very standard. The standard basic box design isn’t all that bad, the box arts are well drawn and eye catching (with the exception of Warplock and Enctounter at L-5, simply because they’re fairly generic space pictures) and the blurbs on the backs are well written and humorous, they make the player excited to play the game. The late box designs are very similar to the early designs but with a few changes for the better. Instead of the fairly generic bold white text for the title there are now personalized and themed titles that are basically works of art themselves. The box art has gotten really good, I’d honestly say that the art for Bermuda Triangle is probably my favorite behind the stuff from Tigervision, and they (at least for Bermuda Triangle and Frankenstein’s Monster) manage to represent many of the elements of the game in the box art without making it cluttered or ruining the overall composition. The backs of the late boxes also finally have a picture showing a screenshot of the game itself, which is a welcome change. The final major change with the late boxes is the addition of a small image on the sides of the game boxes much like what Activision did with their games to denote the theme of the game without the player having to pull the box out. Unfortunately it is rather difficult to find a Data Age box in decent condition, the problem isn’t the durability it’s the color. That silver color will show every little bit of wear and tear the box came across in its 35 years of existence, if you find or own a mint one consider yourself lucky. The manuals are the fairly standard pamphlet style and range in length from two to three folds allowing for 4-6 pages to fill with game info. The early manuals just state the basic game info, and show a picture of the game while also giving you a streamlined explanation of the game for players who just want to jump right into the games. The late release manuals have a bit more meat to them including a character/enemy roster giving details about them and fleshing them out a little bit, these are excellent since their pictures are direct copies of what they look like in-game so you won’t get confused. Also included are small sheets of high quality paper that expand upon the blurb from the back of the box and basically hyping the player up for the game, I affectionately call them Hype Slips, they were included in Data Age’s final three games, and are probably pretty rare so hold onto them if you have them. I also need to mention the game catalogs; there are two versions, late and early. The early version is a standard pamphlet like with the manuals that detail the first five Data Age Games, it’s nothing really special and all the blurbs for the games are the same as on the backs of the boxes, the lade catalog however is a different story. This thing is dripping with effort you really just need to see the scans of it on Atariage or Atarimania since I can’t really do it justice (and the paragraph would get too long), the only things I really need to mention are the games in development section. Data Age was apparently working on games featuring Mr. Bill from Saturday Night Live, Mr. T and Smokey Bear, it also mentions Secret Agent but that one’s actually been found unlike the other three, though I’ll admit that I’d take any of the other three over Secret Agent any day. The cartridges are custom for Data Age with a triangular beveled front and ridges around the sides and back for either grip or aesthetic. The labels are silver paper with the title, art, and info printed on it, like with Imagic and Spectravision carts, this has lead to some issues. Many loose Data Age games develop a strange white crusty substance on the labels and flaking ink is common as well. Every little bump, ding, and scratch will stay on these carts until the end of time, and don’t bother trying to clean them since the ink will come off with the cleaner. Overall the whole package is quite nice, and you can really tell that a lot of effort went into these games, especially the final three. Boxed copies for all of the Data Age come up all the time, even Frankenstein’s Monster, but I would advise you to be wary as they often come up for slightly inflated prices. I would recommend paying no more that 15 dollars for the first five, paying no more than 25 for Journey: Escape and Bermuda Triangle, and don’t pay more than 60 for Frankenstein’s Monster (good luck with that though).